Shimla is the capital of the northern Indian state of Himachal Pradesh, in the Himalayan foothills. Once the summer capital of British India, it remains the terminus of the narrow-gauge Kalka-Shimla Railway, completed in 1903. Travel by the UNESCO-listed Toy Train through the foothills of the Himalayas to explore the town's many attractions such as the Gaiety Theatre, Viceroy Lodge and Scandal Point. 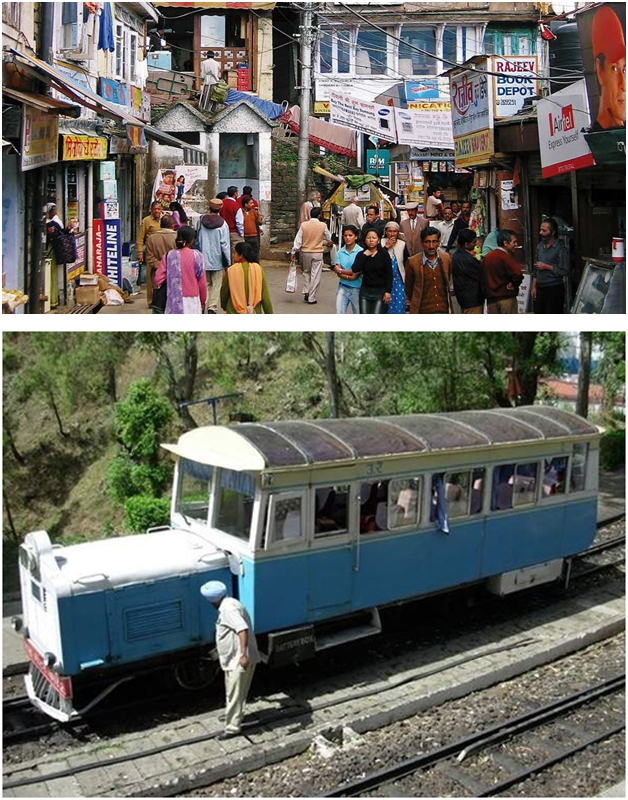 Today, echoes of those bygone days can still be seen in Shimla's plethora of picturesque colonial architecture. As you leave your main tour and in the evening have a dinner in Local restaurant and transfer to Old Delhi Railway Station to board the night train 12311 Howrah Kalka Express departing at 2125 hrs to Kalka. Overnight train journey by first class air conditioned cabin. Arrive Kalka station at 0430 hrs. Upon arrival we change the train, boarding the narrow–gaugeRail Motor 72451 at 0510 hrs / Shivalik Deluxe 52451at 0530 hrs, which has been awarded UNESCO World Heritage status. The train snakes its way through cedar and pine forests, passing pear and pomegranate orchards as we climb into the misty peaks of the lush green Himalayan foothills. The narrow-gauge railway covers 96 kilometers, with stunning feats of engineering found around every corner of track, past little hamlets and terraced fields. The train crosses more than 800 over breathtaking bridges and viaducts and travel through 102 tunnels, 991 curves and passing by important station/ points such as Dharampur, Solan, Kandaghat, Tara Devi, Barog, Salogra, and summer hill through beautiful valleys and hills to the colonial town of Shimla known as “Queen of Hills”. Shimla is nestled in the heart of the Himalayan foothills. The city is a former summer resort, where wealthy colonial residents escaped the sweltering heat of the plains by heading for the mountains, which provided both cooler conditions and a relaxing escape from the hustle and bustle of Indian life. In the mid-19th century the town was chosen as the summer capital of the British Raj. The attraction of your sightseeing tour of Shimla takes you to the Viceregal Lodge. This brilliant building served as the residence of the Viceroy, Lord Dufferin. It was completed by the year 1888 and it is still well maintained. This Lodge has now been transformed into the famous Institute of Advanced Studies and the six storey building still stands in its entire splendor. The lodge has famous gardens and perfectly manicured lawns. Your time here is at leisure to explore, and you may also wish to visit the verdant botanical garden flanking the Lodge. The tour continues for a leisurely stroll along the Mall, taking you past the Gaiety Theatre, the beautiful Victorian-Gothic Christchurch and to infamous Scandal Point. After breakfast you are at leisure, which provides you with the perfect opportunity to travel further into the foothills, where you can enjoy breathtaking views towards the higher, snow-capped peaks of the Himalayas. Alternatively, you could remain in Shimla itself. Perhaps visit Wildflower Hall, a former residence of Lord Kitchener.